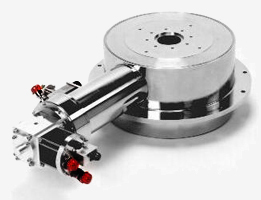 New line of Cryogen-Free Gyrotron Superconducting Magnet Systems - Cryomagnetics, inc.
Cryomagnetics continues their ground breaking development in liquid cryogen-free superconducting magnet systems. The system pictured above was recently delivered to Communications and Power Industries (CPI). CPI’s Microwave Power Products is the world’s leading manufacturer of helix TWTs, klystrons, gyrotrons, coupled cavity TWT’s, microwave power modules (MPMs), and high power transmitters. The superconducting magnet system is a complex, 5-coil system used as an integral part of a gyrotron amplifier. Gyrotron amplifiers are currently under development as drivers for next generation millimeter wave radars. Vacuum devices based on the gyrotron interaction can yield significantly higher powers than are possible with conventional vacuum devices, which will lead to greatly increased radar performance. Gyrotron amplifiers operating at millimeter wave frequencies rely on superconducting magnets to generate the large magnetic fields required for the interaction. The emerging cryogen-free superconducting magnet technology has removed the logistical difficulties of handling liquid cryogens on planes, ships, or remote land-based sites, and greatly increased the attractiveness of gyrotron amplifiers as drivers for high performance millimeter wave radar systems. including superconducting magnets, cryostat, cryocooler, power supplies, temperature monitors, and a custom LabVIEW® operating environment. Cryomagnetics engineered and manufactured all components delivered for this system in-house, with the exception of the Sumitomo Heavy Industries cryorefrigerator system and the computer. Few superconducting magnet manufacturers have the capability of manufacturing such a complete system. This capability is the best way to control quality and keep cost of the system to a minimum. The system features cooling by a Sumitomo Heavy Industries cryorefrigerator in an extremely compact cryostat. The main cryostat body is 18.00″ outside diameter by 13.37″ height. The refrigerator access tube is located on the side of the system. A 3.00″ clear vertical room temperature bore allows access to the high field region. Liquid cryogen based systems are at least twice the size and weight of the liquid cryogen-free system. Five superconducting magnets generate fields to shape and focus the gyrotron beam. These five superconducting magnets have the capability to be energized independently and operated together in many different configurations. Most liquid cryogen-free superconducting magnet systems consist of one superconducting coil or two coils in a helmholtz configuration. Handling heat and stress loads in a five-coil cryogen-free system is challenging. Cryomagnetics’ team of engineers and production personnel met the challenge. In addition to the complexity associated with heat and stress loads from operating five coils simultaneously, the alignment of the coils in relation to each other and the room temperature bore is critical. Precision machining and assembly techniques are necessary to insure the coils and bore tube alignment are within a very stringent specification. Cryomagnetics’ unique internal support system insures this critical specification is met while maintaining low heat leak from room temperature to the magnet assembly. Cool-down time from room temperature to operating temperature is approximately 16 hours. After an intentional magnet quench, the system recovered in temperature in approximately 2 hours. 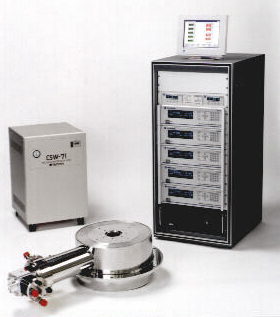 Cryomagnetics manufactures its own high temperature superconducting (HTS) current leads. These rugged HTS current leads allow the magnet assembly temperature to stay below 3.9K while all current leads are energized. The entire system is controllable and monitored via an industrial grade, pentium-class computer. The computer control system features a convenient touch screen monitor and the LabVIEW® operating environment makes total system control easy. The system is fully monitored at all times and has special safety features such as user-definable high and low current alarms. The electronics rack includes five Model CS4 power supplies (update 2009 – the Model CS4 power supplies have been replaced with the Model 4G) powering the individual coils and two Model TM-600 temperature monitors with dual channel capability to monitor the four temperature sensors installed in the system.